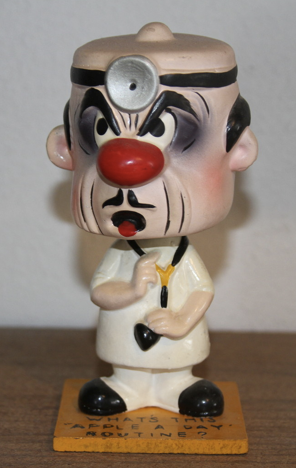 Yesterday one of the extremely old memories of childhood bubbled up in my head in the form of a bobble head doctor. I tend to think of my grandparent's basement a lot, the repository for so many memories. Not only my own memories, but those of the atomic culture of the time, c. 1960. The basement, where my father and uncle had lived, and whose rooms full of artifacts were preserved (unlike my own childhood rooms, which shifted during several moves my family undertook), was a sacred repository of mystery and imagination. Especially as a very young kid certain objects were not just fascinating, but downright terrifying. Such was this thing, found in shadowy, neglected nooks in the ever-dim light of the sweet limestone- smelling space. (For a sound background, put in a David Lynch hum, a thudding breathing from the old gas furnace, supplying the ambient sound.) This little doctor doll was an object of horror, inexplicable, with it's malevolent head flopping and jiggling, as if suffering a neurological disease. The shaking, living quality would always be there, no matter how long you averted your gaze, hoping it to stop the next time you were unfortunate to look at the thing. Better yet would have been, to have the thing be gone entirely. And so it was. Who removed it? It was not just hidden (as a cloth hid the bear head, which scared my brother.) The doctor never popped up again. He may have been simply thrown out by a concerned parent or grandparent. I like how he's holding the stethoscope almost like a weapon, his head mirror seeing to form a hideous third eye. And that lump on his head, my first thought was that it was a gag that a falling apple hit him, but was it probably just a necessary part of that type of mold? Yes, the bump does imply some type of damage, possibly from the apple. But your speculation that it might be functional is probably on the mark, judging from others, which also have the lump. I imagine that the dent allowed better fitting of the pivot spring, or whatever it is that allows the bobble. I would eat an apple a day to keep that guy away. He reminds me of the lineage of creepy figurines such as the one in Richard Matheson's short story "Prey" (which was adapted for the Trilogy of Terror movie).